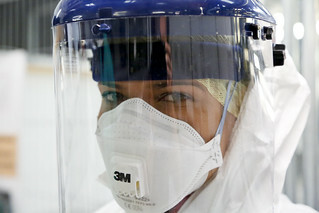 Army trainers show NHS doctors and nurses how to put on Personal Protective Equipment (PPE) that they will wear in the British-built Ebola treatment centres in Sierre Leone. The kit - including overalls, visors, gloves and more - must be put on in the right order to provide maximum protection, as well as removed in a special sequence to reduce risks of contamination. Doctors, nurses and medics from across the UK's National Health Service are joining Britain's fight against Ebola in Sierra Leone. The group - which includes GPs, nurses, clinicians, psychiatrists and consultants in emergency medicine - will work on testing, diagnosing and treating people who have contracted the deadly virus. This image is posted under a Creative Commons - Attribution Licence, in accordance with the Open Government Licence. You are free to embed, download or otherwise re-use it, as long as you credit the source as 'Simon Davis/DFID'.